Leaving the hustle and bustle of Rome behind, we are spending three nights in the little town of Amalfi on the famous and immensely attractive coastline of the same name. 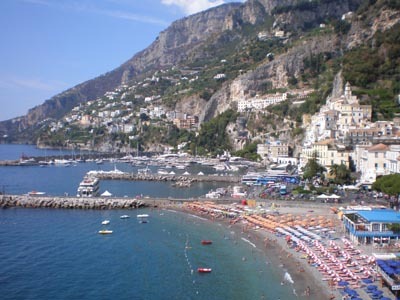 The history of Amalfi reaches back into the Byzantine and Roman empires. The town was Italy’s first maritime republic, even before Pisa and Venice. However, the lack of land (Amalfi is squeezed against the sea by towering cliffs) and various attacks by the Normans caused Amalfi to decline. A disastrous seaquake in 1143 destroyed large parts of the harbor and the devastating plague of 1348 further reduced the town until it became just a sleepy little fishing village. It was “discovered” in the 19th century by tourists. Now we are six of those tourists, enjoying the view from the balcony of the Hotel Marina Riviera.